Supreme Greenskin Warboss Glarsnot Bloodcurdle looked first at the distant ruins of Neujoysi, and then at his own West End Boyz. If the Pandora and its valuable cargo lay within the shattered city, time would be of the essence. Already he had reports from his spies that Chaos troops had landed to the north, and were advancing towards the wreckage of the Imperial transport. Waved on by their Nob, the Stormboyz rokkited onwards towards their primary objective: an ancient refinery complex, and the top-secret weapons crate precariously perched on its upper levels. Alas, one unfortunately Greenskin managed to set alight the pouch of slugga ammo he had clipped to his belt, and detonated mid-flight. Such is the life (and death) of a Stormboy. 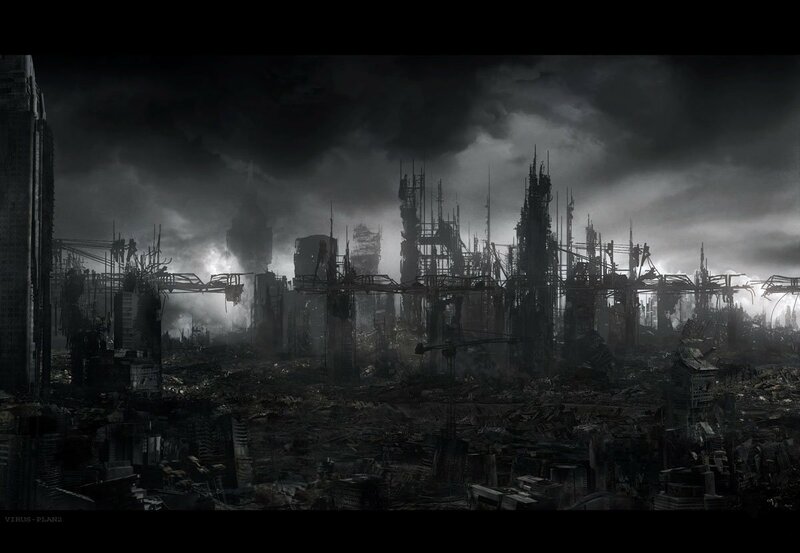 Suddenly, a massive Chaos Demon Prince strode confidently into the central square of the devastated city. 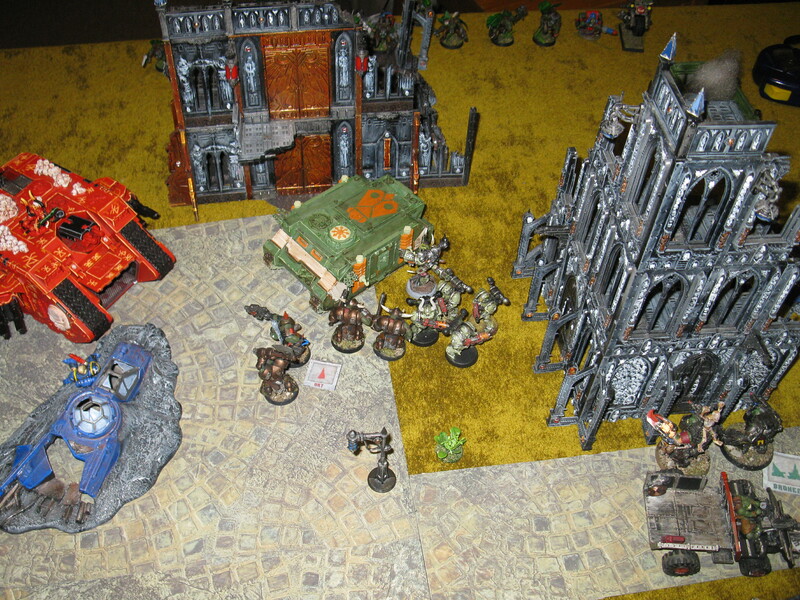 In a thunderous voice that reverberated with the very defiled essence of fundamental evil, it called out a battle challenge to the approaching Orks. As these comprised a series of off-colour “Yo Mama” jokes, they didn’t make a lot of sense: Orks, after all, sprout from fungal spores. Nevertheless, the insult was clear enough. However, with a Land Raider, a Rhino, and two squads of Plague Marines now positioned around the edges of the square, would any Ork be foolish enough to take the bait and advance upon the Demon into the potentially murderous crossfire? Orks being Orks, the answer was of course “Yes!” The Trukk boys sped forward in their ramshackle vehicle into the very center of the square and then disembarked, waving their Choppaz at the massive Demon that stood before them. While this was going on, Glarsnot Bloodcurdle and the MegaNobz clambered out of their immobile truck and fired upon the nearest group of Plague Marines with their combiweapons. Despite no fewer than 14 Burna hits, only one of the Marines went down. To rectify this, the Warboss and the Nobz then charged them, removing their armoured heads from their bloated pestilent armoured bodies. This proved much more effective at overcoming the “Feel No Pain” effect, and the entire squad was wiped out without loss. The Meganobz took the now-abandoned top-secret weapons crate for themselves. 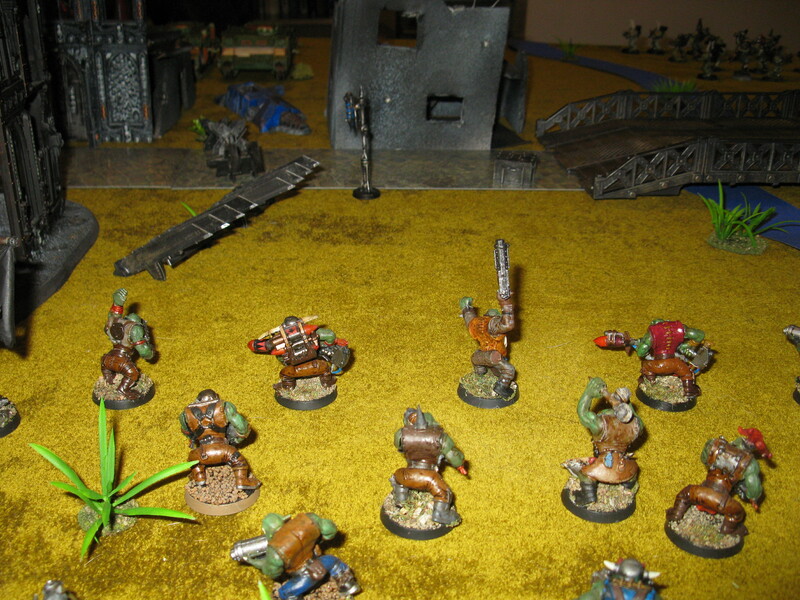 Elsewhere the StormBoyz secured a crate at the refinery, which was revealed to contain a supply of medipacks. The Grots moved into the ruined church and uncovered a crate full of stimdrugs. This seemed a particularly excellent prize in Glarsnot’s treasure hunt, and they ran back towards their own baseline with an extra spring in their little grotty steps. 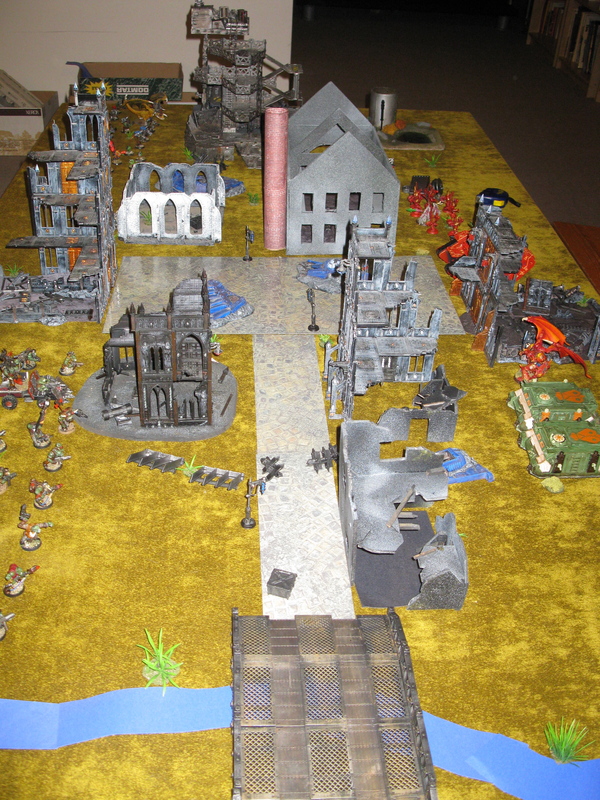 The Deffkopta covered their retreat with Rokkit fire at the Bezerkers, but missed. Finally, there was a rustling of bushes—indeed, some bushes moving altogether—as Boss Snikrot led his group of Kommandos onto the battlefield in the Chaos rear. Among them was Wazdakka Gutsmek, who fired upon the remaining Rhino and immobilized it. The loss of the Demon Prince was a blow to the forces of Chaos, but not an insuperable one. 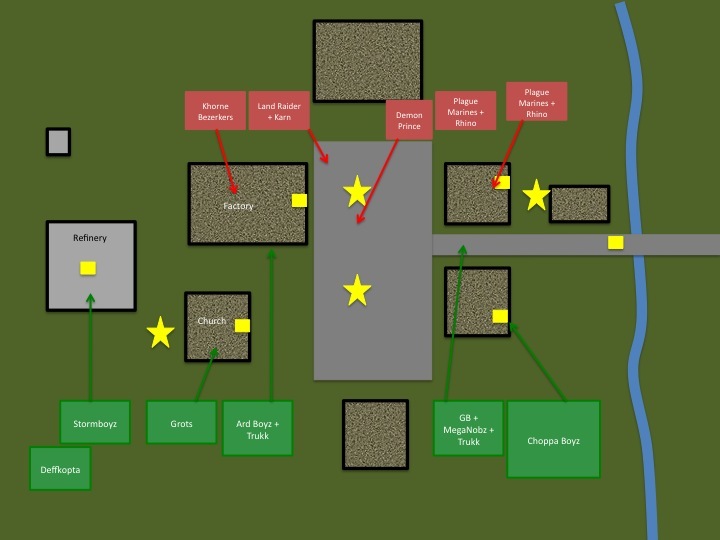 At least the Ard Boyz were now isolated and vulnerable in the center of the square. The Land Raider opened fire on their Trukk—which, in a bizarre manifestation of what could only be described as divine intervention by Mork (or possibly Gork), careened off into the factory ruins and exploded in the middle of the Khorne Bezerkers, killing one. 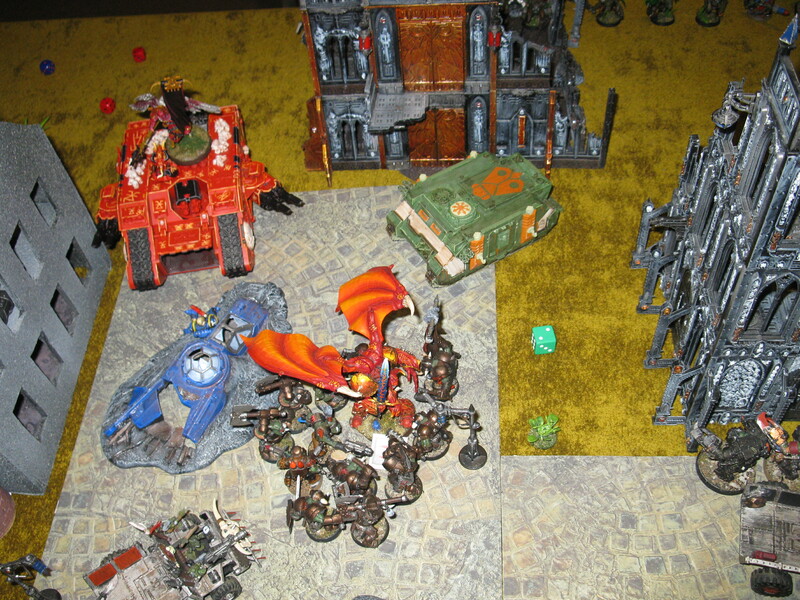 Khârn muttered under his breath, clambered out of the Land Raider in frustration, and charged the Ard Boyz himself. The surviving squad of Plague Marines did the same. Revenge was at hand. While the sight of the Betrayer himself laid low by an Ork might have demoralized lesser corrupted foes, the Khorne Bezerkers were still dedicated to spilling blood for the Blood God. 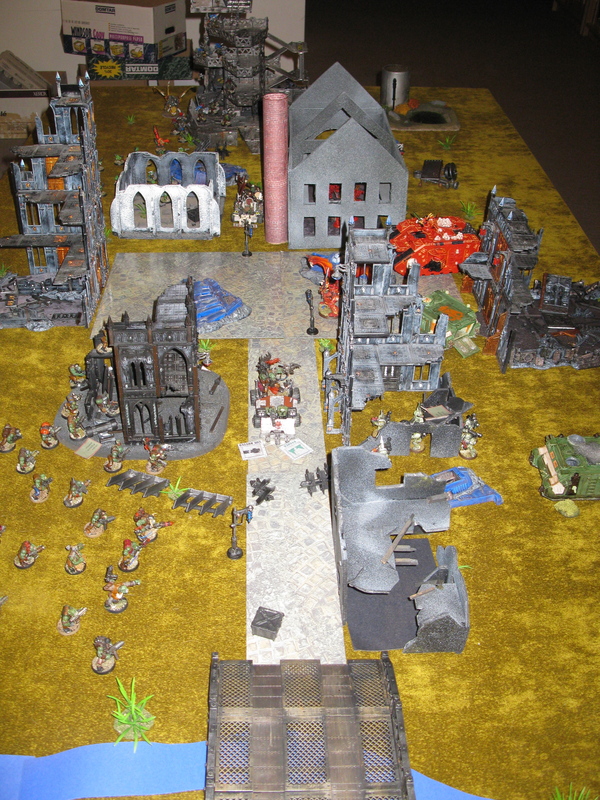 They ignored the weapons crate in the ruined factory and instead ran towards the Grots, hoping to slaughter them (and seize their crate) before the Stormboyz could intervene. 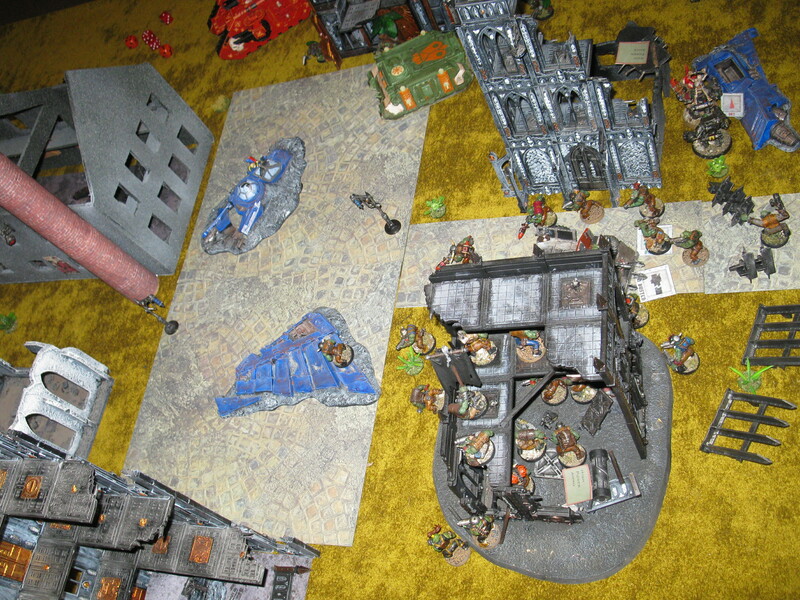 The Obliterator deep-struck between the two Orkish units in an attempt to provide fire support, and shortly thereafter gunned down the Deffkopta. As the Ard Boyz continued their struggle against the Plague Marines, additional Greenskins joined the fray: Glarsnot Bloodcurdle, his attack squig Kuddles, four Meganobz, and Wazdakka Gutsmek. The outcome of the uneven contest was never in doubt, as the remaining Marines were wiped out. Flush with success—they had after all now seen off a Demon Prince, Kârn, and the Plague Marines—the two remaining members of the Ard Boyz consolidated into the very path of the empty Land Raider. Snikrot and the Kommandos attacked the immobilized Rhino, but despite more than thirty hits did little more than stun it. 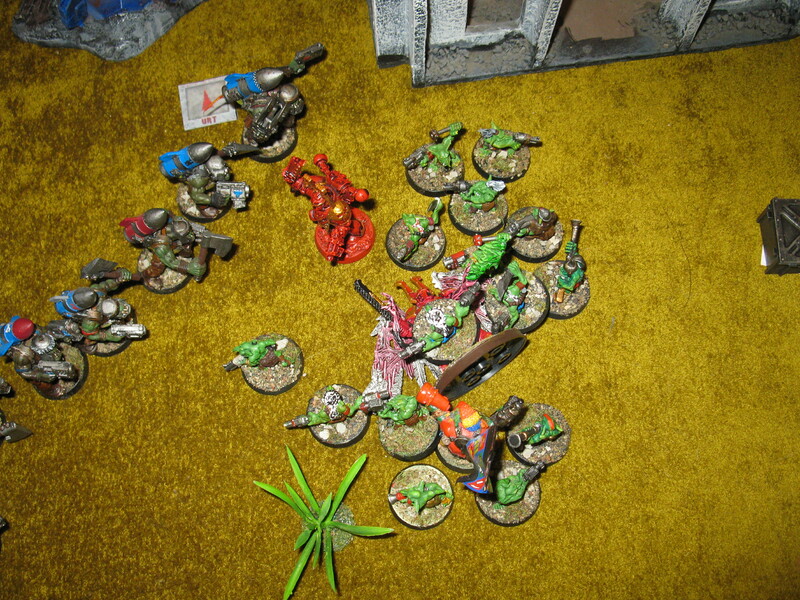 The Stormboyz charged the Obliterator, which was obliterated. The Grots continued to run away from the Bezerkers with their box of drugs, although the latter seemed to be gaining on them rapidly. (Picture above: Grots retreat as homicidal maniacs advance.) The Shoota Boyz retrieved a weapons crate from near the bridge, which turned out to be more advanced weapons sights. The result was to make perhaps the shootiest Greenskin unit in the history of dakka: 55 shots a turn, rerolling both misses and wounds as need be. Although things were going badly for the forces of Chaos, they still didn’t despair. Instead, the Land Raider shot down both surviving members of the Ard Boyz mob, while the Khorne Bezerkers ran and almost reached the Grots. Wazdakka Gutsmek turboboosted his bike and sped towards the Land Raider, opening fire on the behemouth with his Dakkacannon. While landing a few hits, however, he failed to penetrate its thick armour. As for the Grots, it was clear that they were running out of room to flee, with the axe-wielding maniacs of Khorne rapidly closing in on them. What happened next is, of course, the stuff of squeaky green legend. They—yes, the Grots—charged. Subsequent historians would expend considerable debate over the melee that followed. In his book Fear and Loathing in Niujoysi, gonzo journalist Hunter S. Gretchin would attribute the Grot assault to valor, confusion, foolhardiness, and excessive consumption of captured stimdrugs. Chaos officials, of course, deny that the charge ever took place, and routinely torture whomever might question their particular account of events. 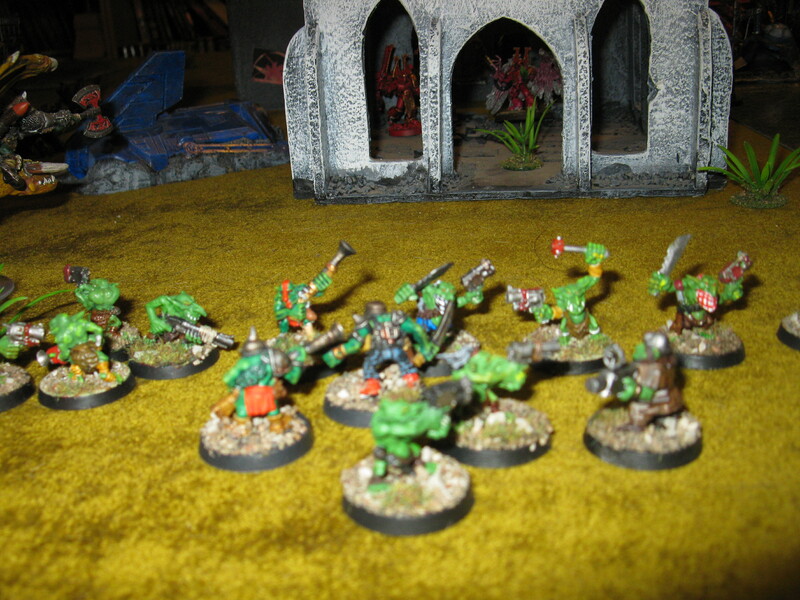 More than a few Orks have been heard to mutter that much of the real fighting was done by the Stormboyz. The wreck of the Pandora and its valuable cargo of top-secret weapons was left in the hands of the victorious Glarsnot Bloodcurdle and Da West End Boyz.